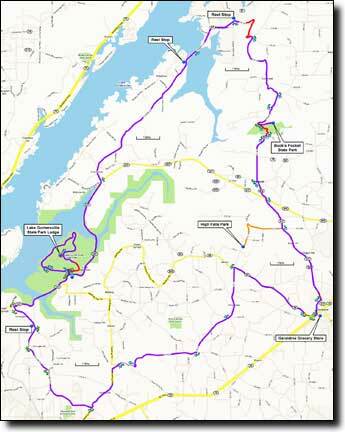 This ride is 63 miles, exploring the parks and mountains northeast of Guntersville. The route is rolling with three climbs and several long hills, traveling on mostly good pavement over varied terrain. 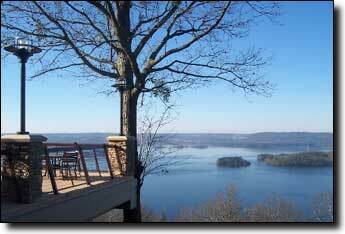 The ride starts at the lodge in the Lake Guntersville State Park. Having recently completed a $25 million renovation this is a very nice start point and the Pinecrest dining room offers a breakfast buffet weekend mornings from 6:30 to 10:00 am for $8, menu only on weekdays. Warning: A bridge on CR-44, between Langston Gap and Bucks Pocket, is currently out. You can bypass it by continuing on CR-38 after the climb, for 2 miles, then Right on CR-41 for 1 mile, Right-Left onto CR-44 for 1 mile, then left onto CR-152, returning to the route. This detour only adds a mile. There's a 54 mile version that shortcuts back to the park and a 76 mile version that adds some mileage in the middle. 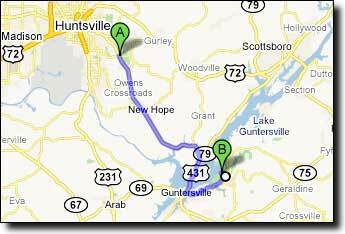 An alternate start point in downtown Guntersville is ten miles closer to Huntsville but adds ten miles and an additional climb to the route, a metric route from the visitors center skips some nice roads for a shorter distance. 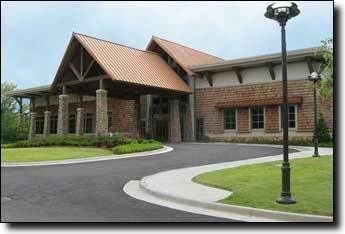 Those wishing to ride from the park but avoid long climbs can ride north along the lake on AL-227 and CR-67 (Google Maps or Alabama Tourism Department map) parking at the Beach Pavilion parking lot to avoid the climb up to the lodge. It's a pleasant and scenic ride for any distance up to 52 miles, out-and-back, mostly rolling hills. 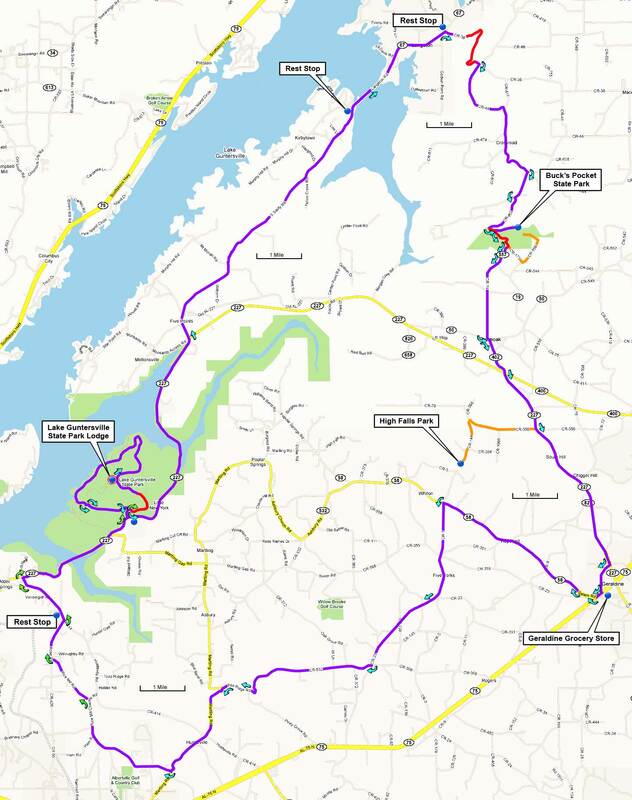 This route begins with a descent to a counter-clockwise tour of Lake Guntersville state park, then travels north along the lake and through farmland to the first climb at mile 20, up Sand Mountain at Langston Gap (topo), gaining 600' in 1.4 miles for an average grade of 8%. This is a pleasant tree-covered climb on a quiet road. The route then turns south for a few miles of rougher pavement, dropping down into the Buck's Pocket State Park at mile 27 for a rest stop at the picnic area (restrooms with water and coke machine but no food). Just before the park the road can be under water if there have been recent heavy rains, though it's usually passable on a bike. The climb out of the park (topo) is short, only a half mile, but gains 270' for an average grade of 10% with a few very steep sections. There's an optional hilly out-and-back side trip to an overlook with a picnic area but no water, left at the top of the climb 0.5 miles, then left for another mile. 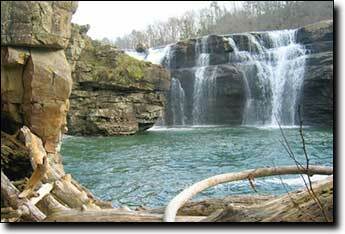 At mile 33 there's an optional side trip to High Falls, a wide waterfall with a bridge and swimming area. This out-and-back side trip adds five miles total on some rough roads, including a short steep walk down to the falls which may be uncomfortable in cleated shoes. While there are restrooms and coke machines the facilities are spartan and the water has a strong mineral taste. The ride continues through quiet and varied farmland, on generally good roads, with a few small 100' to 200' gorge climbs. The route finishes with a descent down off Sand Mountain along a wonderful winding road leading back to the Lake Guntersville state park and the final climb (topo) back up to the lodge, which gains 300' in 0.7 miles for a moderate average grade of 8%. 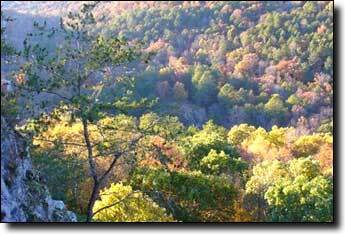 The total elevation gain is 2,950', starting at 1,120' with a maximum elevation of 1,240'.